Wisconsin designated red granite its state stone on March 9, 1971 after the Kenosha Gem and Mineral Society proposed that a mineral and rock should be chosen to promote geological awareness. Red granite was selected because of its abundance, uniqueness, economic value, and historical significance. Among the most popular, the hardest, and the oldest of geosymbols, granite is an igneous rock and is composed of quartz and feldspar. Anderson Bros. Johnson, a division of Michels Corporation, mines the only deep red granite in North America and the only Ruby Red in Wisconsin. Since 1895 they have been mining the state stone at their quarry located north of Wausau. They are also one of the oldest continuously operating mining companies in the United States. 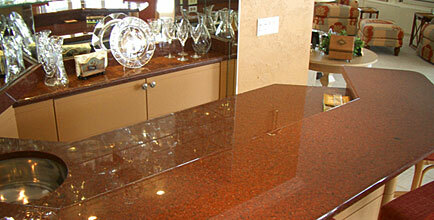 Wausau Ruby Red Granite is one of the hardest and most beautiful granites in the world. Its unique characteristics helped earn its designation as the Official State Stone of Wisconsin. Today, Anderson Bros. Johnson is the exclusive producer and supplier of Wausau Ruby Red Granite for a multitude of uses including monuments, sculptures, countertops, tiles, building stone, landscape stone, armor stone for erosion protection, and crushed stone for road and building construction.